croyce, crois, croys, croyz (14–15th c.), OF. crois, croiz. applied the meaning of hut to Croyser that of hut builder. the Croyser of today’s border region being of Yorkshire. Name similarities exist between, Le Crosand Le Gros and today’s Crozier and Grozier surnames. grand-nephew of William the Conqueror. 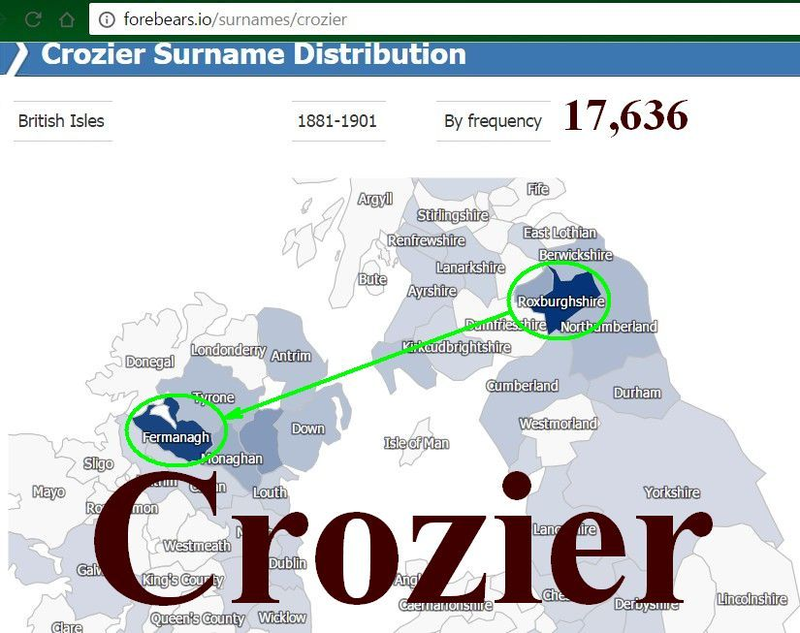 The counties in the British Isleswhich have the highest frequency of the name Crozier are Roxburghshire, which contains, Liddesdale, in Scotland,and Fermanagh, Ulster, Ireland. this is indicative of Germanic-Danish Anglo migration. more like their shared ally the Armstrong. 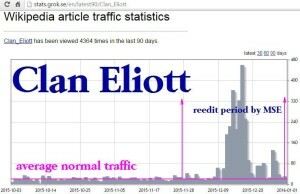 name becomes Eliot of England, but not of Scotland. Locus Crozier; IDs valley of Liddesdale, by locus of Crozier. the people referred to as Croyser lived. Today this valley is believed to be called Riccarton Burn. of the Croyser, originated in the Croyland region. into Croiser, Crosier, lastly Crozier, and Elwald evolved into Ellot, Elliot, and some cases Elliott. (Johannes (John) Elwold (Elwald) de (of) Rya (Rye). Riccarton, mistakenly Rakestonleis, but is Caddroun Tower. 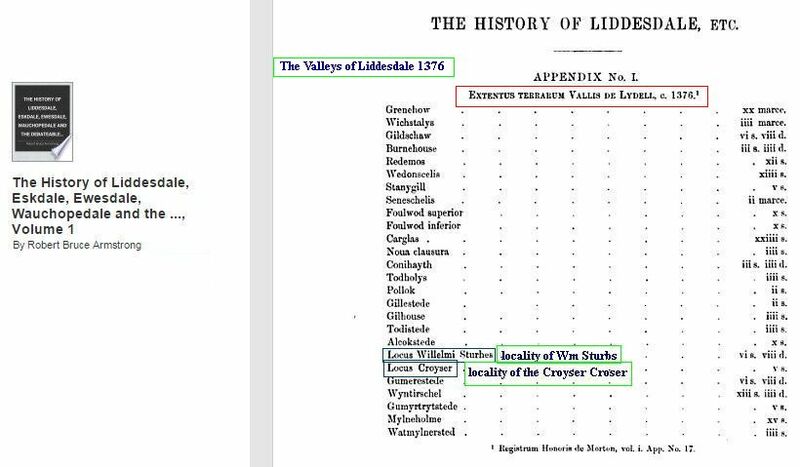 is of William Crosier in 1590.
an Andrew “Dande” Crosar was from Ricardtouncleuch. where both Larristons O&N, are near Riccarton O&N. in Lariston N&O, and the Riccarton N&O Crozier. (Crozier), witness a Scott deed in 1488.
lands of Redheugh, Larriston, Hartsgarth and other. map as being near N&O Ricarrton, and N&O Lariston. feud with the Armstrongs. Married a daughter of Buccleuch. His next brother was Martin Elliot, of Prickinhaugh. then of Hartsgrath with his mother (rf sansine/deed). cousin to Buccleuch gave William the blood of a Buccleuch. Stobs/Redheugh spells their name Eliott. Redheugh Elwald sasine (deed); Crosars witnesses. Lower Liddesdale, not showing Croziers. had towers along the Liddel. of Buccleuch, Vol II page 174.
with slight remains of an ancient tower of the Croziers. being a tenant at Hudshouse in 1541. Burn), on Liddel (refer to; Blaeu map of 1654). Gledstanis land which Crosar are tenants. Tully, Monea, and Tullykelter Castle lands. Liddesdale with their chief stronghold at Riccarton. stones, into the English Plantations and around the world. TIME LINE by Charles Crosier. Kings Chapel for John Crosier and Martha Lindsey. Martha Lindsay 1735 in Boston, Massachusetts. Coat of Arms for armigerous Clan Crozier to share. compact to ﬁt on the vertical member of the cross. 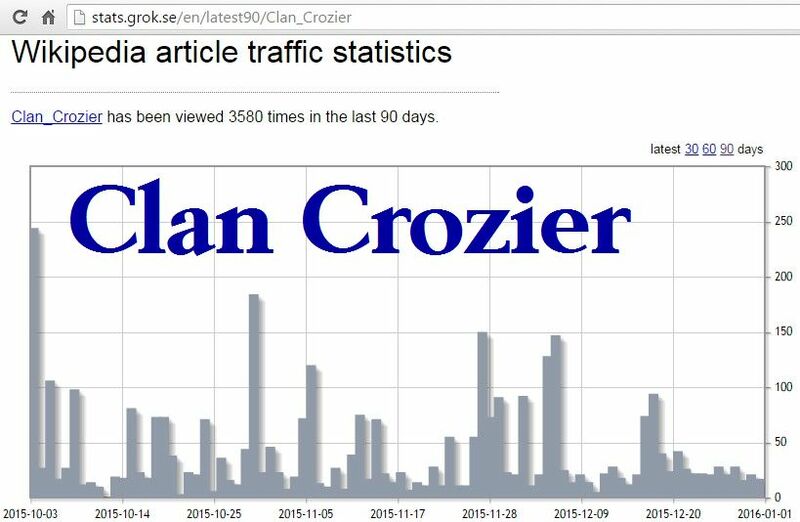 be shared by Clan Crozier. 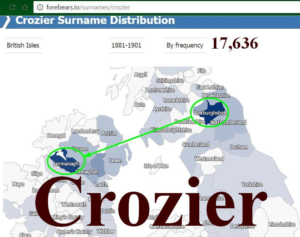 Cross, Cros, Crozat, Crozet and other variant names. probable they would carry similar arms. Bulletin d’archéologie et de statistique de la Drôme, Vol. Middle English Dictionary, Vol 1&2 by Hans Kurath. raw=1 | Cross; World Family results. Colonial Families of Philadelphia, By John W. Jordan. …, Volume 12 By Berwickshire Naturalists’ Club (Scotland). The Exchequer Rolls of Scotland: 1537-1542 By Scotland. The Scotts of Buccleuch, Fraser, William, Sir, 18161898. Scottish arms a collection of armorial bearings,A.D. ..Vol1, By Robert Bruce Armstrong. The Hamilton Papers: A.D 1543-1590, By Great Britain. Book B, pg. 66, Norwalk Deeds, Nov. 18, 1709. Norwalk,Conneticutt Wills; Mch. 4, 1728/9, page 214. Kelly’s Journey: July 2015 http://www.livelovetravelx.co. 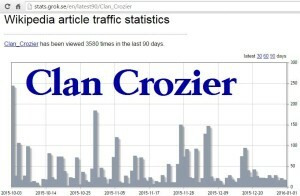 Though given my writings, the activity was high, been excluded with writings deleted from writing on Wikipedia. 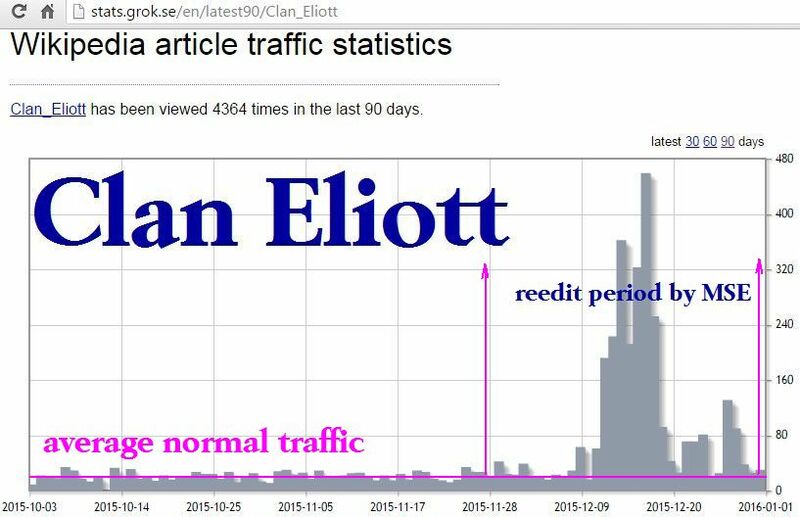 Even though I am an Elliott and a second generation research genealogist, utilizing Y-DNA verification, and chromosomal reasoning of a marsh dwelling elk (moose) returning to ancient homelands near Berlin, people rather believe the elk (moose) then me. Guess I must be half as smart, but twice as bull headed as that elk (moose).